Remnant Fellowship Church LIVE assembly at 9:00am Central Time Zone Worship Assembly. Webcast Replays available beginning at 4:30pm Central Time Saturday. 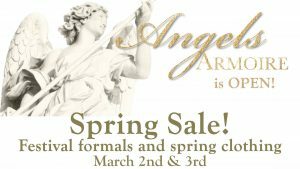 Join us at Angels' Armoire Saturday, March 2nd for winter clearance, spring clothing, and spring formals!